Make sure you rinse the strainer before you cook the quinoa. I like using two parts water for one part quinoa. 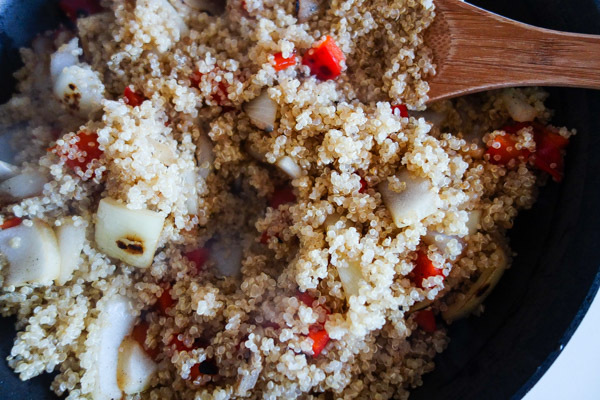 While the quinoa cooks, you can prep your onions, bell peppers, and whatever other veggies you’re planning to add. You can add some garlic too if you want your breath to smell extra good before you begin your day. Sauté your veggies before adding the quinoa. 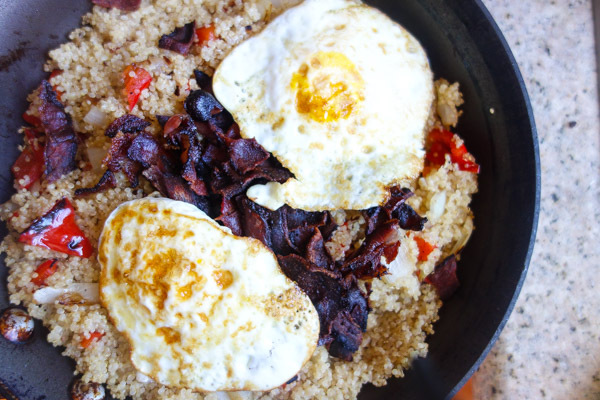 Cook the bacon in a separate skillet (or you can use one skillet, empty the bacon grease, and sauté the veggies in the little bit of grease that is left – YES. REALLY.). Cut up the bacon into pieces after it is cooked. This recipe is really just about mixing everything together. Not much to it. If you don’t like runny egg yolks, you can cook them over medium or scramble them. You’re getting in your protein! 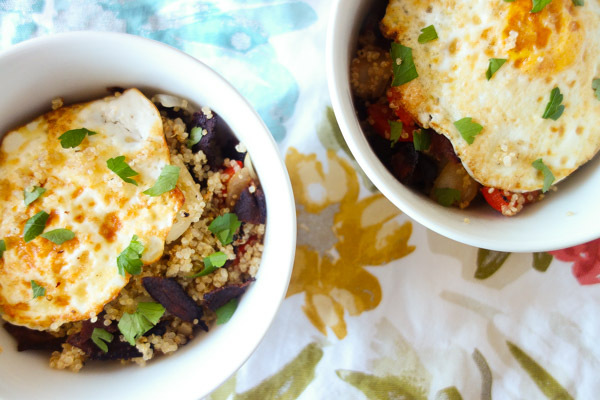 One of my co-workers just told me that eating a lot of grains in the morning could make you more tired, so if that’s true, you make have to balance the risk of sleepiness with the deliciousness that is a quinoa breakfast bowl. I know, how about we sprinkle a little cheese? If you want to make this even healthier, leave out the cheese and bacon. But, let’s be honest, do you really want to miss out on cheese and bacon? Probably not. Happy Friday! 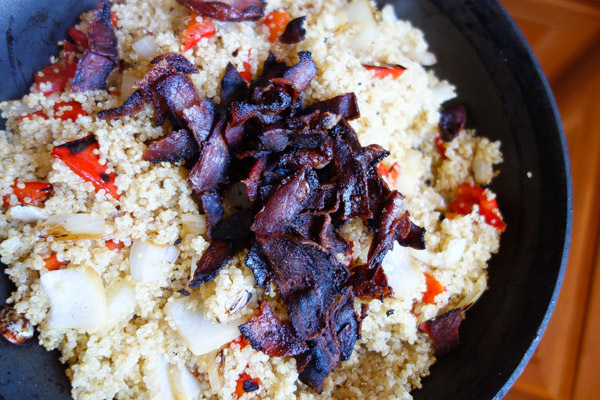 Cook quinoa by using 1 part quinoa to 2 parts water. Cook bacon. While bacon cooks, dice bell pepper and onion. Drain bacon grease and sauté bell pepper and onion in skillet. Add cooked quinoa and seasonings, stirring until combined. In separate skillet, cook egg for 2 minutes. Flip egg, careful not to break the yolk. Cook for an additional two minutes. 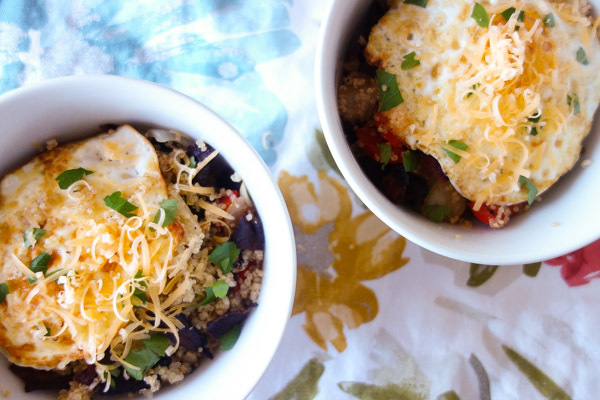 Serve quinoa in bowls and top with egg and sprinkled cheddar cheese. What a great idea!! 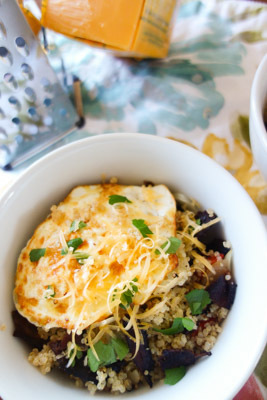 It reminds me of one of my favorite savory breakfasts, which is like the above but uses oatmeal! We do a lot of brunches around here, and this looks like an ideal brunch idea so I have taken note. Thanks for sharing it. I am a big fan of quinoa. I usually make quinoa salads or pilafs. This looks yum! I will however skip the bacon and the cheese! Mine will keep the cheese and bacon! What a delicious way to start your day. Whole grain and a great protein will keep you full all morning long.